A couple of days ago I was at a big meeting to welcome environmental scientists into our university. 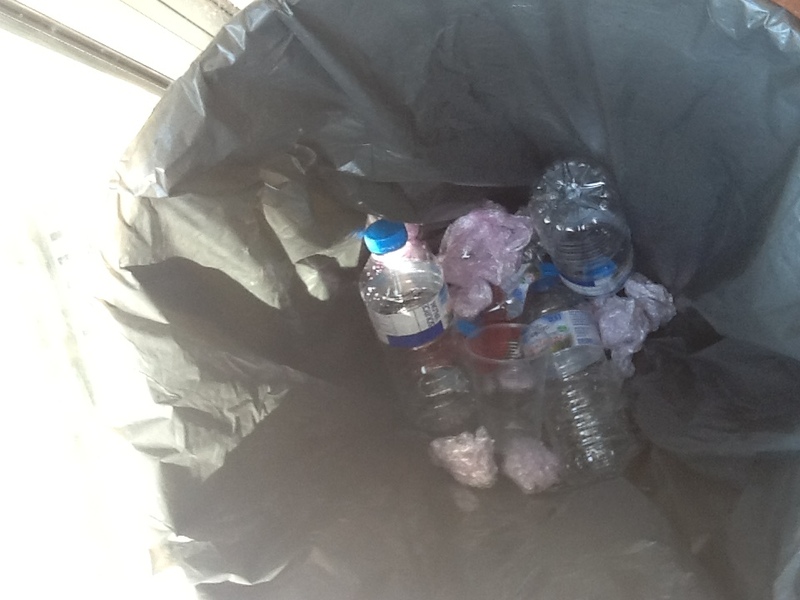 The catering supplied by the university came on non-recyclable plastic, with non-recyclable plastic glasses cups for drinks and some food items that were from infamously unsustainable sources. Instead of going away saying what a great program, half of those going out of the door were talking about the catering faux pas. To be fair, the organizers didn’t expect catering was going to bring the environmental equivalent of platters of grilled panda marinated in dolphin tears, but then again this is something that perhaps they might have anticipated – after all the University administrators have put the Environmental Science Department in one of the most energy inefficient, environmentally unfriendly buildings on campus. In winter, you can see plumes of heat and asbestos leaking from the faculty’s office windows from miles away. This comes after attending a conservation conference a few weeks ago where we encountered environmental faux pas after environmental faux pas, starting with pre-meeting workshops where conservation scientists were putting recyclable materials in the general trash, instead of exerting the effort it took to put their cans in the recycling bin immediately adjacent. In fact, at the finale of the meeting instead of dancing away at the conference’s final party – and anyone who knows me can tell you that I like a good party – I found myself back in my hotel room looking up regulations for a protected area. The conservation conference’s final party was in a local park. The suggestion for this location came from local organizing scientist based in the host city, and from the description it sounded like the entertainment was being organized by a local green group. However, when we arrived, we were greeted by a group of protesters – admittedly the politest, most well-mannered protesters I have ever met. It turned out that the local community were up in arms because over a thousand conservation scientists were descending on the park and they were concerned about the damage to this local protected area. Although the park is open to the public, there are a number of regulations that protect the fragile park environment – for example, bicycles are prohibited. However, residents told me that lorries had been driving in and out of the park all week, putting up marquees and buffet tables, and now over one thousand people were about to descend on the park, and knowing these conference-goers, I knew they would soon be pretty inebriated and partying like a bunch of drunken monkeys. The concerns of the community protest group were not only that this event (the first of its kind to be held in the park) contravened many of the various protective regulations for the park and would lead to trampling of plant life, but also included the fire risk caused by smoking (many delegates were indeed doing this as they entered the park), and also the disturbance the loud music and lights (until the small hours) would cause to local wildlife that inhabited the normally sheltered park. 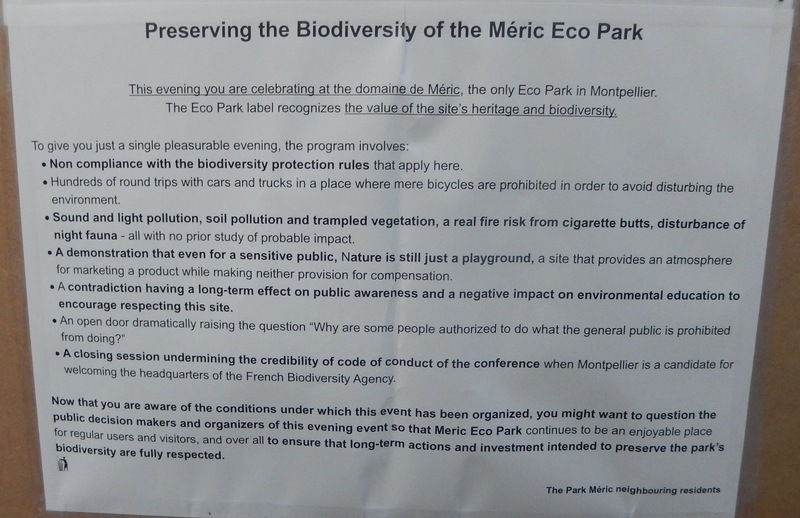 They also expressed concern that there had been no environmental impact assessment done prior to the event, which seems to be a pretty major oversight for an event (that was bigger than some music festivals) in an “eco park”. We spoke to local residents in addition to the protesters, who backed the protest group’s claims and expressed their own concerns about the number of large vehicles entering the park, and damage caused, by the set up for the party. Now, to make it very clear, the meeting staff and the non-local organizers had no idea about the controversy prior to the meeting, which apparently had even been big news in local newspapers. On paper the party venue looked like a really great idea. But what really disappointed me was that the number of conservation scientists who saw the protest, and even talked to the protestors (who were very eloquent and extremely polite), but who went into the venue apparently without a second thought. There were some who very rudely brushed off the community group. This was coming at the end of a meeting where issues such as the need for conservation scientists to understand social dynamics of local human communities, to work with local stakeholders and to better engage with the public – not to mention to ensure effective management of protected areas – were running themes. People who had, not hours before, been vehemently talking about the importance of respecting the concerns of local human communities, were now ignoring the very valid concerns of the hosting community. What really got me was when one of the protestors, after they had been rudely brushed off by a conference delegate, plaintively called after them “I thought you cared about biodiversity conservation, I thought you were conservation scientists”… It really upset me that now there was a community conservation group that would think that scientists didn’t care conservation. During that particular meeting there had actually been a session about the need for conservation scientists to “walk the walk”. The session was based around a survey that looked into how many conservation scientists regularly tried to reduce their impact. Discussion turned to the conference and discussions on how the organizers had tried to reduce the impact of the meeting but, conversely and ironically, had they had also received a number of complaints from delegates about the inconvenience caused by these measures – such as that the air conditioning wasn’t high enough (was set too warm), programs were online instead of printed out for everyone automatically, there was a lack of materials given to delegates as conference “goodies”, bottled water was preferred over jugs of perfectly clear and fine tap water, and there was too much vegetarian and vegan food. Not to mention, as mentioned above, all of the conservation scientists who ignored the strategically located recycling bins and threw their recyclables into the general trash (or vice versa, throwing trash into the recycling). The major challenges of conservation and environmental scientists is to change the behavior of humans, so they have less impact on species, biodiversity and the environment. However, what hope do we have of doing that if conservation scientists don’t change their own behavior, even though they know better? It’s not enough to talk the talk, but they must also walk the walk. If even those that really understand the problems can’t be bothered, the future for the world is truly bleak…. Apparently there were many conference attendees who also expressed their concerns about the impact of the end of conference party mentioned above. The meeting planners have taken the complaints onboard and have stated that are going to do an investigation. Some of my faith in humanity has been restored, although for those that don’t think this is a problem, and continue to not walk the walk… badly done, colleagues, badly done …. What kind of scientist do you want to – and should you – be?